A great toy for kids 12 year old and up is the Razor Pocket Mod Electric Scooter. Kids will enjoy the freedom that this fun and safe electric scooter can bring. 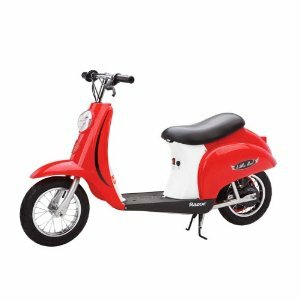 The Razor Pocket Mod Miniature Euro Electric Scooter isn’t new this year, but it has been so popular on Amazon with so many great reviews for years, that I thought it was worth giving it a look today. What kid wouldn’t love and want this?! Let your child cruise the sidewalks in style! You can choose from 5 different color combos and capture tons of moments where your child is beaming with gratitude! This scooters features include a retractable kickstand, variable-speed acceleration, a padded seat, and a built-in battery that travels for up to 10 miles on a single charge and up to 15 miles per hour. There’s a great little storage compartment underneath the seat to store a few things and it has a wall plug to charge the scooter so no messing with the hassle of taking out a battery to charge. This scooter is recommended for ages 12 year old and older but many of the reviews on Amazon say their kids as young as 8 use it safely. See pricing and availability here.